Published: Feb. 4, 2019 at 12:27 a.m. Updated: Feb. 4, 2019 at 02:03 a.m.
Tom Brady led a fourth-quarter touchdown drive to lift New England over the Los Angeles Rams in Super Bowl LIII at Mercedes-Benz Stadium, with the 13-3 final standing as the lowest outcome in Super Bowl history on Sunday in Atlanta. The Patriots won their sixth Vince Lombardi Trophy -- all since 2001. Check out the best moments and plays from the game. 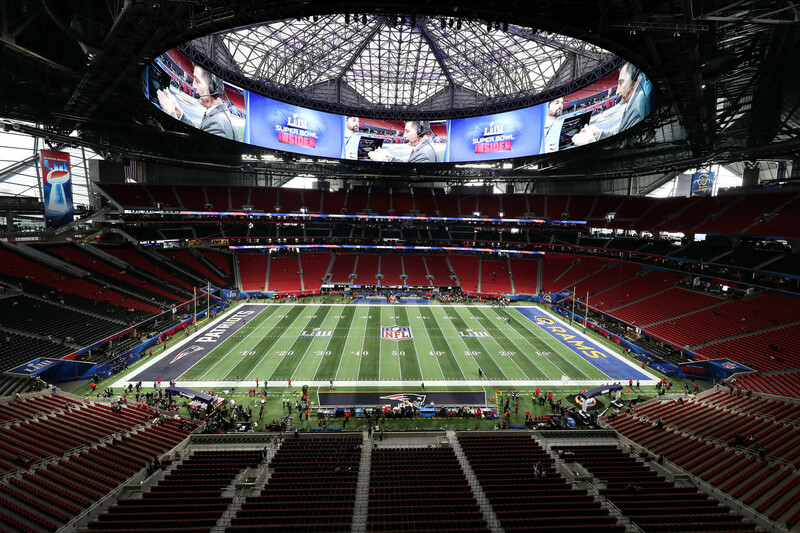 A general view of Mercedes-Benz Stadium, host of Super Bowl LIII. Mercedes-Benz Stadium opened in 2017 and is the host stadium for the Atlanta Falcons and Atlanta United FC (MLS). Seating capacity is around 71,000. The 360-degree HD video halo board in the stadium is the largest video board of its kind in the world (63,800 square feet). Notable Patriots and Rams coaches and players from the metro Atlanta include Sean McVay, Gerald Everett and David Andrews. The world's fastest man Usain Bolt, Olympics gold medalist, throws the football around the field while on the NFL Network set. New England Patriots quarterback Tom Brady (12) walks into the stadium. Brady is making his ninth Super Bowl start, no other QB has made more than five (John Elway). Brady will become the third player in NFL history to play in nine Super Bowls/NFL Championship Games. Former UFC featherweight/lightweight champion Conor McGregor on the sideline with his son. New England Patriots head coach Bill Belichick stands on the field for the Super Bowl. Belichick has been involved in 22.6 percent of Super Bowls all-time. Since the Patriots hired Bill Belichick in 2000, the team has the highest win percentage in the NFL (.740), and the defensive guru has led the NFL's third-ranked scoring defense (18.8 PPG allowed) over that span. Something to keep in mind though, the Patriots also have the NFL's No. 1 scoring offense (27.3 PPG) since Belichick took over as head coach. Los Angeles Rams quarterback Jared Goff warms up. Tom Brady and Goff have the largest age gap between starting QBs in Super Bowl history - Brady on game day: 41 years, 184 days old. Goff on game day: 24 years, 112 days old. Age difference is 17 years, 72 days old. Jared Goff was the #1 overall pick in the 2016 NFL Draft and made the Super Bowl in his 3rd season. That is the fastest a QB selected #1 overall in the NFL Draft has ever reached the Super Bowl. Four former No. 1 overall QBs reached the Super Bowl in their fourth season (John Elway, Troy Aikman, Drew Bledsoe, and Eli Manning) and went 2-2 in those games, including Manning's win over Tom Brady and the Patriots in Super Bowl XLII. New England Patriots quarterback Tom Brady (12) runs onto the field during pregame. Since Super Bowl XXXVIII in 2003, Tom Brady, Ben Roethlisberger or a Manning (Peyton & Eli) has played in every Super Bowl except one, Super Bowl XLVII (Ravens vs 49ers). Brady, Roethlisberger, and the Mannings have a combined record of 11-6 in Super Bowls. New England Patriots head coach Bill Belichick and Los Angeles Rams head coach Sean McVay greet on the field. History has shown the Rams and Patriots made the right choice by hiring their current head coaches. Since the Rams hired Sean McVay in 2017, the team is tied for the best win percentage in the NFL (.750) and the offensive wunderkind has orchestrated the NFL's best scoring offense (31.4 PPG) during his tenure. Super Bowl LIII will mark the first time Boston and Los Angeles face off in the Super Bowl. From ELIAS: The Patriots will face the Rams in the Super Bowl LIII, exactly 98 days after the Red Sox clinched the World Series against the Dodgers. This marks the first time in history that the Super Bowl will bring together teams representing the same cities or regions that produced the World Series opponents just a few months earlier. Los Angeles Rams defensive end Michael Brockers (90) leads the team in a pregame huddle. Chris Long of the Philadelphia Eagles, winner of the Walter Payton NFL Man of the Year award waves to the crowd standing next to the Houston Texans' J.J. Watt. Los Angeles Rams cornerback Marcus Peters (22) greets Marshawn Lynch. Chloe x Halle perform America the Beautiful. Gladys Knight sings the national anthem. Los Angeles Rams nose tackle Ndamukong Suh (93) stands for the national anthem. A general view of the coin toss as the New England Patriots' Matthew Slater called heads. The coin landed on tails. Here is the story on why Matthew Slater always calls heads on the coin toss. Teams to win the coin toss are 24-29 all-time in the Super Bowl and teams to win the coin toss have lost five consecutive Super Bowl. Los Angeles Rams inside linebacker Cory Littleton (58) celebrates after intercepting the ball on the first throw of the game. New England Patriots tight end Rob Gronkowski (87) runs with the ball after a catch for 19 yards. Los Angeles Rams defensive end Michael Brockers (90) celebrates after New England Patriots kicker Stephen Gostkowski (3) missed a 46-yard field goal. New England Patriots quarterback Tom Brady (12) fumbles the ball as he is sacked by Los Angeles Rams defensive end John Franklin-Myers (94) and defensive tackle Ethan Westbrooks (95). The Patriots recovered the loose ball. Tom Brady has done a lot of incredible things in the Super Bowl. One thing he hasn’t done so far: score a first-quarter TD. In the Patriots’ eight previous Super Bowls with Brady, the only first-quarter points they’ve scored came on a field goal in their SB LII loss last year, per NFL Research. New England Patriots wide receiver Julian Edelman (11) runs out of bounds after a catch and run for 25 yards on a third and 1. Julian Edelman has passed Michael Irvin for the second-most receiving yards in NFL postseason history. Only Jerry Rice has more receiving yards than Edelman in the playoffs, per NFL Research. New England Patriots kicker Stephen Gostkowski (3) celebrates after kicking a 42-yard field. The Patriots are 4-0 in the Super Bowl when the score is tied after the first quarter (Super Bowls XXXVIII, XXIX, XLIX, LI). By the way, each of those four games were tied at 0 after the first quarter, per NFL Research. Los Angeles Rams kick returner JoJo Natson (19) runs with the ball on a kickoff return for 27 yards. Los Angeles Rams wide receiver Robert Woods (17) catches the ball near the sidelines. Woods was targeted 10 times for 5 receptions for 70 yards. He was held under 80 rec yards for 4th straight game. Los Angeles Rams quarterback Jared Goff (16) throws the ball deep down the field. Rams did not have an offensive drive gain 50+ yards and punted on 9 of their 12 possessions. New England Patriots middle linebacker Kyle Van Noy (53) sacks Los Angeles Rams quarterback Jared Goff (16) on third down. The Patriots and Rams just completed the 2nd-lowest scoring 1st half in Super Bowl history. Only Super Bowl IX, when the Steelers led the Vikings 2-0, had fewer 1st half points than Super Bowl LIII. The Steelers went on to win 16-6 for their 1st Super Bowl in franchise history, per NFL Research. New England Patriots middle linebacker Kyle Van Noy (53) celebrates after a sack. The Patriots did not allow any 1st half points for the 2nd straight game... Their 2 opponents? The #1 (Chiefs) and #2 (Rams) scoring offenses in the NFL this season. The Patriots are 41-1 when shutting out opponents in the 1st half in the Belichick/Brady era, including playoffs, per NFL Research. Adam Levine of Maroon 5 performs at The Pepsi Super Bowl Halftime Show. Travis Scott performs at The Pepsi Super Bowl Halftime Show. Big Boi performs at The Pepsi Super Bowl Halftime Show. Los Angeles Rams running back Todd Gurley (30) carries the ball for a 16-yard game. Gurley finished with 10 carries for 35-yards. Gurley struggled to maintain his regular-season production in the playoffs. Los Angeles Rams cheerleaders perform. Los Angeles Rams quarterback Jared Goff (16) throws the ball under heavy pressure from New England Patriots outside linebacker Dont'a Hightower (54). The Patriots defense produced one of its strongest defensive performances in a Super Bowl in the Belichick era. Los Angeles Rams wide receiver Josh Reynolds (83) catches the ball in front of New England Patriots cornerback Jason McCourty (30). Jason McCourty and Danny Shelton became the first players in NFL history to go 0-16 and then win a Super Bowl the next season (both members of 2017 Browns). New England Patriots cornerback Jason McCourty (30) breaks up a pass intended for Los Angeles Rams wide receiver Brandin Cooks (12). Patriots tied record for the fewest points allowed in a Super Bowl (3). New England Patriots outside linebacker Dont'a Hightower (54) sacks after a sack. Hightower's final stat line, 2.0 sacks, 3 QB hits, 2 TFL, 1 pass defended. Hightower now has 3.0 sacks in his last 2 Super Bowls (did not play in Super Bowl LII, torn pectoral). His strip-sacked of QB Matt Ryan in Super Bowl LI assisted the Patriots’ comeback from a 28-3 deficit. Los Angeles Rams kicker Greg Zuerlein (4) kicks a 52-yard field goal. Zuerlein had the 2nd-longest FG made in Super Bowl history (53 yards). Los Angeles Rams head coach Sean McVay coaches from the sideline. New England Patriots cornerback Stephon Gilmore (24) knocks the ball loose as Los Angeles Rams running back C.J. Anderson (35) carries the ball. The Rams recovered the ball. The Patriots defense held the Rams to 260 total yards (198 passing, 62 rushing). New England Patriots tight end Rob Gronkowski (87) catches the ball for a 29-yard catch and is downed at the 2-yard line. Gronkowski has been the most dominant postseason tight end in NFL history. Gronkowski is the only tight end in NFL history with 1,000+ career receiving yards in the playoffs. Gronkowski finished the 2018 playoffs with consecutive games of 6+ receptions and 75+ receiving yards; he had only 2 such games in the entire 2018 regular season. New England Patriots running back Sony Michel (26) scores a touchdown on a carry. Michel rushed for more yards (336) and TD (6) this postseason than any other Patriots running back in the Brady-Belichick era. Michel is 1 of 8 players to rush for 6+ TD in a single postseason. Patriots set a franchise record for most rush yards in a Super Bowl (154). New England Patriots quarterback Tom Brady (12) celebrates after a running back Sony Michel (not pictured) touchdown for the games first touchdown. New England Patriots cornerback Stephon Gilmore (24) and strong safety Duron Harmon (21) break up a pass intended for Los Angeles Rams wide receiver Brandin Cooks (12). New England Patriots cornerback Stephon Gilmore (24) intercepts the pass intended for Los Angeles Rams wide receiver Brandin Cooks (12) inside the red zone. Gilmore's INT was the first 4th-qtr INT in a Super Bowl by any team since Patriots CB Malcolm Butler intercepted Russell Wilson in final minute of SB XLIX. Final stat line for Gilmore, 1 INT, 3 passes defended, 1 forced fumble. New England Patriots running back Rex Burkhead (34) carries the ball a 26-yard run. New England Patriots kicker Stephen Gostkowski (3) celebrates after a 41-yard field goal. New England Patriots quarterback Tom Brady (12) hugs owner Robert Kraft. Tom Brady became the only player in NFL history to win 6 Super Bowls. Los Angeles Rams head coach Sean McVay greets New England Patriots head coach Bill Belichick after the game. Belichick has won all 3 of his Super Bowls against offenses that ranked Top 5 in scoring and total offense (Super Bowl XXXVI, LI & LII). Belichick is 11-3 in the playoffs against Top 5 scoring offenses since 2001. Bill Belichick has the most Super Bowl wins of any head coach and has tied Hall of Famers George Halas and Curly Lambeau for the most championships by a head coach in NFL history (6). New England Patriots quarterback Tom Brady (12) hugs Los Angeles Rams quarterback Jared Goff (16) surrounded my members of the media. The Rams have lost both of their Super Bowls vs the Patriots; lost SB XXXVI to Patriots in 2001 season (lost 20-17). Los Angeles Rams head coach Sean McVay walks off the field. New England Patriots middle linebacker Kyle Van Noy (53) celebrates with tight end Rob Gronkowski (87). Los Angeles Rams quarterback Jared Goff (16) walks off the field as the confetti falls. Goff finished 19 for 38 (50%) for 229 yards and one INT for a passer rating of 57.9. NFL Hall of Famer Joe Namath walks with Vince Lombardi Trophy towards the podium. Super Bowl LIII featured 58 fewer points and 484 fewer total yards than last season’s Super Bowl (Eagles vs Patriots in SB LII). New England Patriots quarterback Tom Brady celebrates on the podium. Brady has 6 Super Bowl championships, the most by any player all-time and has two more Super Bowl championships than any other QB in NFL history. Boston-area major professional sports teams have won a combined 12 titles since 2001. New England Patriots wide receiver Julian Edelman celebrates with the Lombardi trophy. Edelman became the first wide receiver to win Super Bowl MVP since Santonio Holmes in Super Bowl XLIII (vs Cardinals). Edelman is the second Patriots WR to win the Super Bowl MPV (Deion Branch in SB XXXIX. Edelman's 115 playoff receptions trail only Hall of Famer Jerry Rice (151) for most in NFL history and his 1,412 receiving yards in the playoffs, passing Michael Irvin and Cliff Branch for 2nd-most all-time. New England Patriots quarterback Tom Brady celebrates with his daughter Vivian Lake Brady as the confetti falls. Brady (41 years, 184 days old) is the oldest QB to win a Super Bowl. New England Patriots cornerback Stephon Gilmore (24) celebrates . Patriots quarterback Tom Brady celebrates with his family after New England's victory over the Los Angeles Rams. New England Patriots fullback James Develin kisses his son in celebration. New England Patriots linebacker Brandon King celebrates in the locker room.